While many aspects of work have changed dramatically over the last few decades, society has struggled to adapt, to the detriment of working families. Work schedules and demands continue to reflect a time when at least one parent stayed home, women remain underpaid relative to men on average, and public schools still base their hours on an agrarian calendar. 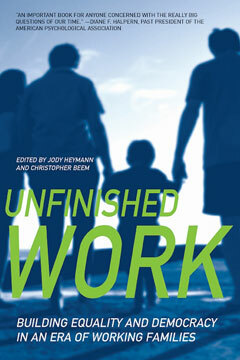 Unfinished Work provides insights into why we have not yet seen an effective national response to the challenges faced by most working families in America today, and offers solutions from leading thinkers in the field across the disciplines of political science, sociology, economics, history, and public policy. Contributors include David Almeida, Christopher Beem, Eileen Boris, Henry E. Brady, Ellen Bravo, Lisa Dodson, Laurel Elms, Nancy Folbre, Bradley K. Googins, Janet Gornick, Donald J. Hernandez, Jody Heymann, Sheila B. Kamerman, Daniel A. McDonald, Marcia K. Meyers, Marcie Pitt-Catsouphes, Juliet Schor, and Robert Wuthnow.